Just as Helen is pushed to her breaking point, a mysterious new Scion comes to her rescue. Funny and brave, Orion shields her from the dangers of the Underworld. But time is running out--a ruthless foe plots against them, and the Furies' cry for blood is growing louder. Do you ever have a book that you really want to read, but you're just not in the mood for? Dreamless was that kind of book. Even though I'd been anticipating it for months, when it finally arrived from the library, it didn't interest me. Still, I figured that I might as well read it and opened up the first page. Less than 24 hours later, I closed the book after 487 pages rearing with exciting and dreading the months wait for the third book. 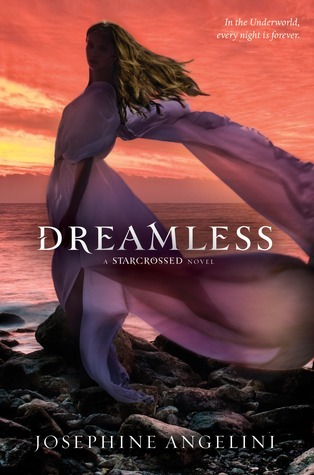 Dreamless was a thrilling ride and kept up with the fascinating plot and great romance of Starcrossed. Dreamless sticks close to the standard second book plot. Girl gets further involved in the paranormal world (since she knows she is paranormal herself). Girl and boy separate emotionally and physically. Third wheel enters and tempts girl. Eventually, chaos ensues. Plot in a nutshell. While Dreamless doesn't break any new plot ground, the story still feels fresh and exciting. The action gets going quickly. Helen is on a quest to find the Furies in the Underworld and free herself and others from the curse that makes the different Houses kill each other. She is going to hell and back every night (as the book jokes a few too many times). Things up on Earth aren't that great either. A Myrmidon, an incredibly powerful ant masquerading as a human (which somehow doesn't seem ridiculous while you're reading it) is after Helen and isn't afraid to destroy anyone who gets in his way. I love how the book is told in third person, from multiple viewpoints. While Helen is the main character, we also get Lucas and Zach's point of view, as well as others. It's fun as a reader to know all sides of the story when the characters don't. I continue to like Helen. Like most things in this book, Helen isn't a unique personality. She's nice, smart, selfless, loyal to friends and family, and more. She doesn't have a well defined flaw other than stubbornness and a tendency not to adequately follow instructions. Even if she doesn't break any new ground, this personality type is a literary standard for a reason. I continuously rooted for Helen to succeed at her quest and in her love life. A love triangle is a significant part of this book. I was irritated by this at first, but it makes sense the more I think about it. Our Helen is the Helen of Troy - "The Face." Of course, there would be a multitude of boys falling for her. In Dreamless, we're introduced to Orion, a guy so cool that I don't know which team to root for. Perhaps that's because he's not that distinguishable from Lucas in personality. Both are handsome, confident, funny, smart, and devoted. Lucas has more of an anger problem than Orion. Orion is a bit more humble and haunted, having been on the run for years, than Lucas. Part of me thinks the characters should be better defined, but another part of me is happy to see two awesome guys. Josephine does a fabulous job at working in elements of Greek mythology and The Iliad into the story. I've never been a fan of Greek mythology, but I was able to pick up on lots of tiny references to myths that I'd learned in school. It adds an extra layer of fun onto the novel - I felt smarter by noticing it - but never drags the story down. Nothing holds this story back, in fact. A combination of bad deeds done to Helen and our heroes as well as human mistakes (which is always important in Greek mythology) leads up to the beginning of a great showdown awaiting us in Book 3. I can hardly wait! I loooved Orion so much!! And I had a few problems with Helen in this book, the way she was easily convinced Lucas hated her felt so wrong for me and actually annoyed me! From the love of life to the hate of life in a few moments??? Anyways, I cannot wait for the next book! I read this back in Dec/Jan as I got a proof through work and I loved it! I also loved Orion and I can't wait for the last book! I've done that with a couple of books now, even though I know when I pick them up and read that first page, I'll be entranced. Love that this one broke through your ennui and wouldn't let you put it down! I'm glad you ended up enjoying this book despite not being in the mood for it and the formula plot (which I didn't even realize too much while reading it lol). I've yet to read book 1 and I think it's because I'm such a huge fan of Greek mythology. I know this one doesn't follow the myth exactly which is why I've been stalling but I've heard good things about it. I should give it a try. Glad to see you that enjoyed the book. I really liked it as well. Although, I'm hoping the love interest finally gets to be with each other. This is one of my favorite series, I loved Orion but I am still hoping for a Helen & Lucas HEA. A wonderful review! I am pleased you enjoyed Dreamless. Wow, that's awesome that you ended up enjoying this one so much after not expecting it! I love it when that happens. I can't decide whether I would love this series or not. It sounds sort of cliched... but then again, sometimes predictability can be a very comforting thing! Oh fun! I haven't really been in the mood to pick it up either, even though I liked Starcrossed a lot. You give me motivation :) I like how even though so many things in the book are following the same old standards and even though the characters aren't as developed as they could be, it's still a fun story. You confirmed a lot of my feelings about Starcrossed and made me feel a lot better about what to expect with Dreamless. Thanks! Subsequently despite the fact that, when economically founded, they have a tendency to maneuver into the high course swiss replica watches segment - for just a Longines or maybe a Maurice Lacroix. Most current daily life-type which can a lot of people ordinarily confront all of them is actually " Fendi design watch In . TimeIf your Flickr marketed advertisement strategy is made for a small company in the buy instagram followers of 30000 your social websites dollars can be greatest expended someplace else The same goes for the function by using a greatest attendance of 10000 the place you only assume that all around 75000 would be interested in studying it Your Flickr advertisement time can be greater expended taking care of endorsing your hashtags to the eventOutbid. What's Your Favorite Twilight Movie?